So for the past couple of months, I’ve been so busy with work that I didn’t really had the time to sit down and spend time with my 2 kids. With so deadlines to meet, as well as trying to figure out what was wrong it was so difficult to squeeze a little bit of time with them. Especially the little one, who now seems to stick to me like glue when mummy is not around. So after a long discussion with the wife, I promise to commit a certain period of time with them. 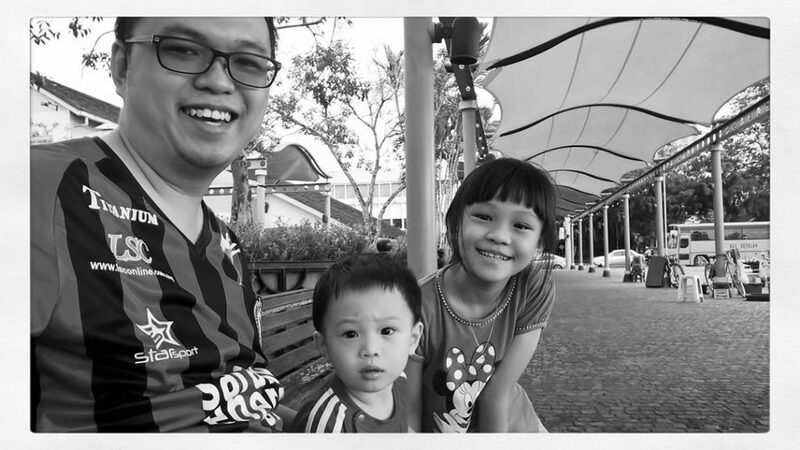 So the picture above was taken during Gawai Eve, where I took the both of them out to Waterfront for a walk. Wanted to rent the bubble stick but unfortunately for me, so here we were trying to see what we could actually do to pass time while waiting. Little T, was having fun running around the waterfront space where Big Sister E and I was busy chasing him. Never the less, we had a great time before I went and bought the bubble gun which got me running even faster. Big Sister E had a blast, blasting bubbles while Little T got excited tried popping each and every one of them. Being able to spend time with them, just playing without having to worry about work for that moment made me realized I’ve been missing out so much in their lives. So I told myself I need to get myself straighten out and try to prioritized that my family comes first. Big Sister E always wanted to ride with me for the longest of time. She would always asked me where did I cycled to this time, or who else was with me during the time of cycling. I would then tell her where I’ve been, and she would keep asking me if she were older can she follow me. And the answer I always give her was Yes. Anyway, the bicycle above belonged to my brother. As he complained that it was uncomfortable for him to ride on. When I first saw it I found out that the size was too small for him to actually use it. That’s why it was so uncomfortable for him, never the less since he didn’t want it so my mom asked me to bring it back to Kuching with me since they didn’t had any more space in the store room. I’ve already decided what to do with the bike before it reached Kuching. As I went and purchased carrier at the back as well as a seat cushion and hopefully with it I would be able to send Big Sister E to school using this bicycle. So after sending it for a full service last week, I went and gave it a spin on Monday just to make sure it was safe to ride. Was completely satisfied with the performance, and my orders just came in time for me to bring Big Sister E around. So on Tuesday, I pretty much got the rack, seats as well as head lights. So on Tuesday night, I went and set up everything and we were pretty much good to go. So on Gawai morning came, I went and woke Big Sister E up and told her to get dressed as she’s following me out to get breakfast at High Bread. We wore our matching Geng Sepeda Borneo jersey and soon we were on our way. Initially there was a slight difficulty on handling the bike as I wasn’t used carrying passenger around on the bike. But once I got the hang of it, she was already laughing with excitement and joy. So once we arrived our destination, we went and locked the bike and placed our order. We ordered to glasses of milk while waiting for the rest of our order to arrive. I got to spend more quality time with her talking about the plans on what we’re going to do with the bike. Of course she was excited when I told her we’re going to try her school route the following day, and can’t wait for the day to end. So the next day we tried cycling to her school and it was do-able, but that was without the normal heavy traffic which I have a little bit of concern on her safety. We were suppose to go and have a ride earlier this morning but it was raining so our plans were cancelled. Never the less, I’ll probably rethink on the route we will use when school opens. So anyway, throughout the whole time spending time with my kids I think they don’t really expect much from me (for now). But the fact of doing things together really makes them happy, and I really enjoyed that. I know, I have only 10 years left with Big Sister E before she start venturing out on her own. And I calculated, if I spent about 1 hour a day with her. I would only have about 150 days with her, which is about 5 months. So what’s going to happen from now onward? Well, I’m going to make full use of the amount of time I left with Big Sister E and Little T. And hopefully will post many more adventures here on my blog which pretty much been stagnant for a couple months already. Again, I would like to thank my brother who indirectly gave me the bike. But I’ll probably replace when I get back to Miri with a bigger one for him the next trip when I go back to Miri. Also to Ghee Hoe Hin Trading for servicing the bicycle and great deals for the extra stuff I needed to carry Big Sister E. So hopefully this won’t be the last thing I post on my kids, and if the weather permits tomorrow hopefully I’ll bring Big Sister E out again for breakfast.